This piece by Dave Shunk is part of our Future Military Fiction Week for the New Year. The week topic was chosen as a prize by one of our Kickstarter supporters. The nation state had decided not to invest in robotic armies. Autonomous killing machines were beyond their ethics. However, the enemy had no problem building autonomous robotic killing machines. The enemy robotic land assault caught the nation state by surprise. The enemy forces especially sought to destroy the nation state’s treasure nicknamed “The Grail Project.” The enemy’s battle plan sought to overcome the human defenders at the various Grail Project sites by overwhelming swarms. The tactical fight went badly against the solely human forces defending the outlying Grail Project sites. The horde of enemy robotics on land, sea and air were the perfect attrition strategy. Soul less killers, mass produced, networked together and built cheaply with advanced 3D printers in secret production facilities were deadly. The nation state had not pursued the robotic armies but went a different route. HAL and Major Wittmann were the first experimental AI/Human team at training site “One” adjacent to one of the remaining Grail Project sites. They were a prototype weapon – human and AI bonded together as a weapon system team within the tank with a shared neural network. However, this tank was unlike early 21st century tanks. This tank had advanced weapon systems – a tank on technology steroids. HAL (Human Armor Liaison) is the artificial intelligence (AI) that controls the tank, the weapon systems, and communications. HAL is incorporated and encased into the advanced nanotechnology shell of the tank. HAL has self repairing armor and neural circuits woven into the structure of the tank. HAL also monitors the physical and mental health of Lt Wittmann via the neural connection with nanobot sensors throughout his body and bloodstream. Major Wittmann has twelve years of service. He is a combat veteran, tank commander and human crew of one. With genetic, physical and mental screening beginning in preschool, Major Wittmann began his military training early. He had the mental and intellectual capability for the nation state’s Human Performance Enhancement program. During his initial military training he received the neural implant for direct communication with advanced computer AIs. He also received nanotechnology enhancements in the form of nanobots in his blood stream to enhance and accelerate his cognitive and physical attributes. HAL and Major Wittmann had trained as a team for two weeks. Due to the neural implant and nanobots, the bonding program progressed much quicker than human to human bonding. Days of training became the equivalent of months or years of purely human to human bonding. As the first AI/Human armored team they would chart the course for the fight against purely robotic forces. The speed of warfare had overtaken purely human skills due to AI and robotic technology. At the same time science and technology opened new doors such as AI/human teaming, enhancing both warriors. Orders came down to protect the Grail Project adjacent to HALS/Major Wittmann’s position at all costs. HAL monitored the battle flow from the network and Major Wittmann correctly anticipated the enemy tactical attack plan. Within .01 seconds HAL detected the inbound swarm of enemy hypersonic missiles meant for the Grail Project. HAL countered within .001 seconds by launching a counterstrike of steel flechettes which intercepted, detonated or deflected the inbound hypersonic missiles. Inside the tank, observing from his 360 degree visual hologram of the battle, Major Wittmann thanked HAL via the neural network for his quick and decisive action to protect the Grail Project and them. HAL and Major Wittmann knew if the enemy held to his doctrine, the robotic tanks would be next on the scene and attempt to destroy the sole AI/human tank. 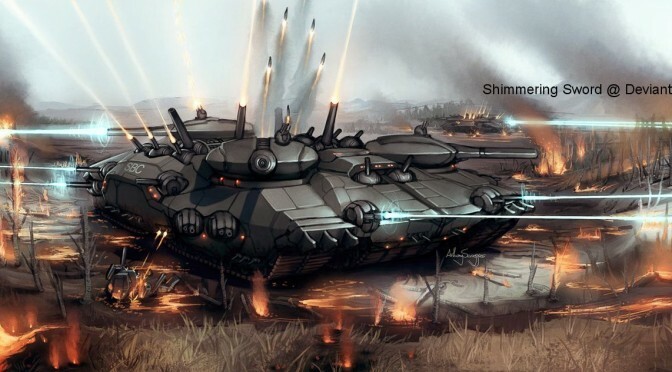 The twenty enemy robotic tanks announced their arrival by firing their laser cannon main weapons. Within .002 seconds of their firing HAL modified the external nanotechnology armor to disperse the energy along the entire hull and recharge the backup energy grid. Before the last laser impacted the hull, HAL counter targeted the enemy robotic tanks. HAL fired the multiple barrel railgun and destroyed or severely damaged the robotic force. Fifteen burning hulks remained stationary and would move no more. Five other damaged tanks attempted to retreat. In .003 seconds HAL targeted the five with miniature hypersonic anti-tank missiles turning them into molten scrap. The enemy robotic scout force had been destroyed. HAL knew they would need reinforcements to defeat the upcoming main robotic assault force. Major Wittmann came up with the “Improvise, Adapt, Overcome” solution. On the training grounds in an underground warehouse were ten more experimental tanks – with AI’s on board but no human team member. Due to neural limits Major Wittmann could not directly control another 10 AIs – but HAL could. Major Hartmann use his command emergency authority to over ride HAL’s protocol and programming limits. These limits stated that HAL could not control other AI tanks – a limit set by the nation state in peacetime. But this was war and the Grail Project must survive. HAL reached out to the ten tanks in warehouse by their AI battle network. Within .001 seconds the AIs received the mission, the situation, enemy order of battle, and threats. With the AI’s knowledge of military history, one other AI suggested that they form a laager around the Grail Project . The Boers, like American wagon trains in the 19th century, formed mobile defensive laagers. The laager consisted of vehicles forming a defensive perimeter in whatever shape needed. The eleven AI tanks and one human formed a formidable interlinked mobile defensive perimeter around the Grail Project. The battle ended quickly. The massed mobile firepower of the tanks overwhelmed the robotic attack force, but at a high cost. Tanks 1, 3 and 5 suffered catastrophic laser burn through on the armor plating destroying the AIs. Tanks 2, 4 and 8 suffered massive missile hits which destroyed various armaments reducing their offensive effectiveness to near zero. The burning remains of the robotic army demonstrated they had fallen short of destroying the Grail Project at Site One. In the classic struggle of over whelming force against determined defense, the combined AI/human teaming had turned the tide. HAL watched the unfolding scene with curiosity as Major Wittmann exited the tank. The Grail Project at Site One had survived without loss. As the doors of the Grail Project opened, Major Wittmann, age 22, reached down and picked up his four year old son and gave a silent prayer of thanks as he held him once more. His son had just been admitted with other select four year olds to the AI/Enhanced Human Performance Military Academy (The Grail Project). Eighteen years ago Major Wittmann had been in the first class of the Grail Project in 2032. The paper is meant as a wakeup that technology is changing warfare in a unique way. The era of human on human war is almost over. With artificial intelligence (AI) and robotics the speed of warfare will increase beyond human ability to react or intervene. The paper presents one possible solution. This article was first published in the Winter 2001-02 issue of Parameters. The second intent of the paper is a tribute to the military science fiction of Keith Laumer and his creation of Bolos – tanks with AI and teamed with military officers. His writings in the 1960s and 1970s were not really about just Bolos but about duty, honor and a tribute to the warriors. I read Last Command in the late sixties and devoured all the Bolo stories. Dave Shunk is a retired USAF Colonel, B-52G pilot, and Desert Storm combat veteran whose last military assignment was as the B-2 Vice Wing Commander of the 509th Bomb Wing, Whitman AFB, MO. Currently, he is a researcher/writer and DA civilian working in Army Capabilities Integration Center (ARCIC), Future Warfare Division, Fort Eustis, Virginia.